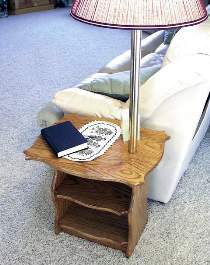 A combination end table, lamp, and magazine rack. Brass lamp column provides a clean design. Measures 21"H to top of table x 22"W x 17"D. Plans drawn FULL SIZE. Order hardware parts package separately or see Special Offer. Lamp End Table Hardware Parts Package Includes push-thru socket, 8 foot clear cord set, lamp harp, lamp pipe, solid brass 19" tube and miscellaneous lamp hardware. Project plan, light bulb, lamp shade, wood and wood finish not included.